10 Best Bible Journaling Gifts for Christmas - Plus Giveaway!!!! You are here: Home / Bible Journaling Gift Ideas / 10 Best Bible Journaling Gifts for Christmas + Giveaway!!!! 10 Best Bible Journaling Gifts for Christmas + Giveaway!!!! What are the best Bible journaling Gifts? Christmas is just around the corner, and my husband is always asking me what I want for Christmas. 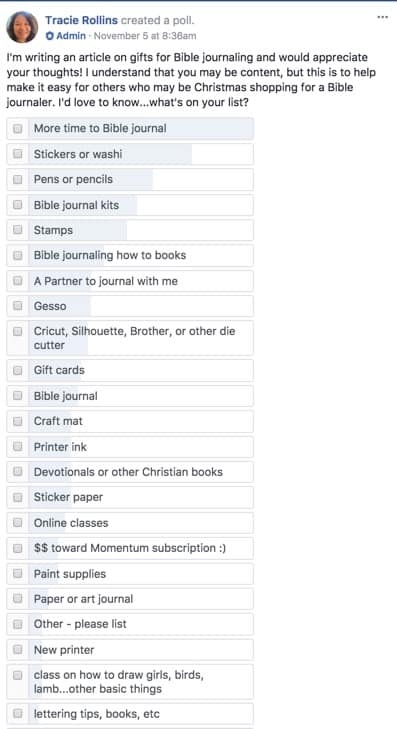 While we don’t focus on the gifts much, I do want to make it easy on him (and others), so I polled the Bible Journaling for Beginner’s Facebook community to find out what they’d like to have. Can you guess what made the top spot? 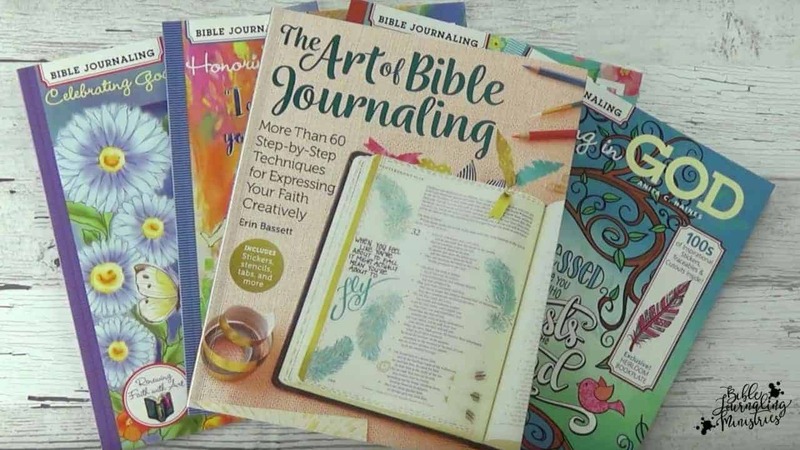 Scroll down to find out, but before you do…make sure you’ve entered our contest to win a fantastic set of Bible journaling how-to books. Enter to win using the form below. You will be taken to another site to enter if you do not enable cookies on your browser. Good luck! Gift cards are so easy to buy, and they’re perfect for the person that’s hard to buy for. Here are the gift cards I recommend for Bible journalers. Please note that there are affiliate links in this post. You don’t pay more when you use our affiliate links and it really helps support us. Thank you! Who wouldn’t want to Bible journal with a friend? If you have a friend that’s into Bible journaling, ask her over for some fellowship. You’ll build your relationship while building your knowledge and growing closer to God. It’s a win-win-win! If you’re having a hard time finding a partner, please consider joining our Bible journaling for Beginners community. It’s like having your own family of Bible journalers who are passionate about God! Bible journaling in its present form hasn’t been around for very long even though note-taking in the Bible has been around for decades. There’s something amazing when your right and left brain work in harmony to bring the story to life, and you finally make sense of it all. Bible journaling helps you remember the lessons, the stories, and verses and makes it easy to explain it to all ages. But, you must start at the beginning if you want to do it and not “ruin” your Bible. I put “ruin” in quotes because I don’t think you can ruin the Bible if you’re using it for what it’s intended to be used for — to build your knowledge of the Word, grow your relationship with God, and spread the good news. The Complete Guide to Bible Journaling – You can watch my review here. The Art of Bible Journaling-You can watch my review here. Stickers and Washi tape came in at number two. Who doesn’t like washi tape? 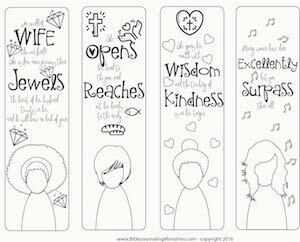 Illustrated Faith as a wonderful line of faith-based washi tape here. More time to Bible journal is the leader of the best Bible journaling gifts according to a poll from our Facebook group of over 12,000 members. That makes a lot of sense. We are all busy, especially during the last quarter of the year. If you’re in retail or you deliver packages, it’s even worse. Not only do you have the stress of making end of year numbers, but you also have frantic shoppers, and packages to deliver. Of course, if you work in corporate, you’re busy too with year-end activities, planning, and hopefully a Christmas party or two. For moms like me, we’re attending school functions almost every week, and if we’re lucky, we may even bake a few goodies. But, truth be told, I’ll probably stop the by the bakery on my way to the cookie exchange. And no…I won’t tear off the label and pretend they’re mine. I’ll wear my “I cheated” shirt proudly because I’d rather be a little shamed than miss the gathering altogether. I’d love to know what’s on your wish list this year! Let me know what you think the best Bible journaling gifts are in the comments below. I would like a new computer for Christmas, to help me with my Bible journaling. I would love to be able to access all the journaling videos and websites. I’m rather undecided this year.perhaps the guide to bible journaling . My Christmas list includes a silhouette portrait, some supplies, gelatos or distress ink. My favorite is the list of things to give the Bible Journaler more time! Being retired, I have plenty of time, but these are great ideas for friends and family who have families, jobs, etc. Since I am fairly new to Bible Journaling, my wish list is HUGE! I was hesitant at first, but I did fall in love with the right/left brain working together 😍 in the Word! #7 would be the perfect gift for me!!! I live in an area that is always “behind the times,” and it’s tough to find anyone to study and journal with. Thanks for the giveaway offer! That’s awesome! Gift cards! Thanks for the chance to win. I could use almost everything on the list, but some gift cards to buy supplies at Hobby Lobby and Michael’s would be wonderful. My Christmas wish is for: Inspire Bible. The complete Guide to Bible Jounaling book, Gelatos mist maker, and Ranger Heat It Craft Tool, as well as any other Bible Journaling supplies! I have to add Trusting in God book to my list if I don’t win…it was absolutely stunning in your review on youtube. I would like the 84 pk of Faber Castel Pitt Artist Brush Pens, the Prisma Premier Colored Pencils Portrait (skin tones, and a quality set of water colors. My supply list would be complete after this. A partner to journal with would be great. I’m starting a Bible Journaling Group in January and would love some “how-to” books to share with my group! Bible journaling has strengthened my faith and drawn me deeper into the Word and I can’t wait to share this with a group of women. I am hoping for a Cricuit or Silhouette this year to cut out all my stickers. I use tons of stickers and washi. I love to Bible journal and love the Illustrated Faith stuff and books that are about Bible journaling. So many but would love gelato’s and watercolors. I love your site and videos. Thank you so much. I’m asking for supplies this Christmas as well!! I want a bigger Derwent inktense set! They are one of my favorite supplies! I want a Silhouette Cameo 3, I am a single mom and I live with my parents so I wont get it, but its wht I want. I have stamps on my list. I am not very artistic so I love using stamps. Thanks for the chance! Stamps !!! I love using stamps in my bible journaling. I am a single mom of 2 boys 1 girl. ( been a single mom for 16 years now) so budget is the key. But nonetheless it’s my wish getting cute stamps. A solo eye Cameo would make my year!! These books are so awesome they are definitely on my Christmas Wish List along with online courses. I also have the new Inspire Praise Bible on my Wish List as well. Thanks for posting the reviews – I wondered what these books were like and love seeing the contents with ideas about how to use them. So helpful and informative! These books are great for beginners!! Thank you! I am so excited about this giveaway……how awesome it would be to win!!!! What a great giveaway! These look like awesome books! What inspired you to start this ministry? Hi Judy. This was a calling from the Holy Spirit. Thank you for asking! I’d so love a new printer!! … or two … I’d also love a Canon Selphy!!! I have tons of supplies but one thing that would really help would be to have Photoshop or something similar to aid with printing out just the things I want to use and not everything else on the page. Hello Tracie, seeing that I am new at bible journaling I would love a good set of colored pencils, maybe a set of 150 with all different colors. Oh Boy! This is so nice and exciting! I would love more art supplies–the permanent inks and pastels would be an great addition to my current supplies. I wouldn’t mind a travelers journal either. I see them quite a bit lately and think it would be fun to cover a specific topic in one journal. Top of my Christmas list is the gift of dedication and commitment to my Bible studies and prayers. I would enjoy receiving The Art of Bible Journaling. Above that on my list is carving out more time to do my Bible Journaling. Thanks for all your examples, ideas, and support! Love the books and this site! I have been the primary caregiver for my mother-in-law since October 2016. She had a stroke on my birthday and past away two days later. We had her funeral yesterday. I just want some quiet time to bible journal some of the things on my heart. Wishing everyone a truly blessed Thanksgiving weekend! Give thanks to the Lord, for He is good! His love endures forever! A good set of colored pencils would be a must especially for those who use bookmarks and margin strips. I am a brand new Bible journaler, so any type of supplies would be really nice. I have seen different starter kits that look really nice and helpful, so maybe those. I have so many things to help my in my Bible journaling, but a gift card from Amazon would be wonderful! A travelers notebook & journaling Bible. My wishlist is simple: color pencils and stamps. I love these books. They are on my Christmas wishlist!! More time and the die cuter machine, for sure! Thanks for the awesome giveaway! And the poll!